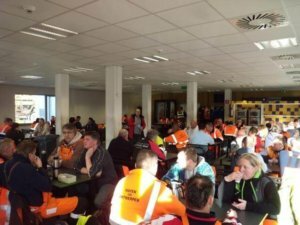 On 4 February ETF affiliated unions BTB-ABVV, ACV Transcom and ACVLB held actions in the Belgian ports to raise awareness amongst dockworkers of the disputes in Portuguese ports. During the meetings with the workers the three unions explained that the Portuguese situation has to be framed in a wider context where organisation of port labour and labour rights are being challenged in several European countries. The action is part of the solidarity campaign that is being carried out at European level by ETF and IDC affiliates to support the Portuguese dockers. Pictures of the actions taken over the last month are available here.